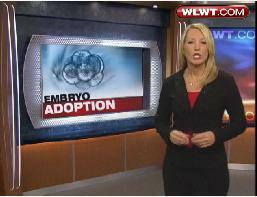 CINCINNATI -- Some couples unable to get pregnant have turned to an unusual form of adoption. The couples are getting pregnant with another couples' embryo. Jennifer Schanne and her husband endured four miscarriages before turning to in-vitro fertilization. "We froze our embryos in case something didn't work or we only had one baby. We knew we wanted to have more then one," said Schanne.